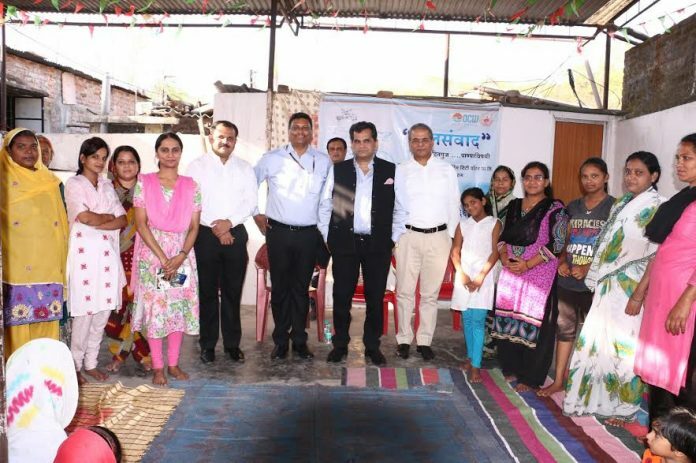 Nagpur: NITI Ayog CEO Mr. Amitabh Kant visited Gittikhadan Slum on 14th April 2017 to see the work of 24×7 Project and the changes brought by the 24×7 water supply in the lives of thousands of people. He met a gathering of 50-60 beneficiaries in Madarsa at Dashrath Nagar to know their experience in this regard. It must be mentioned here that Dashrath Nagar Slum (Gittikhdan) is an area of 250-300 houses which was facing water problems historically. People had to depend upon stand-posts for fetching water. For 30-35 houses there was single stand-post. Fights over getting water often turned grievous. Contamination was another major problem. The water had foul odour and solid waste was also seen in the drinking water. In 2014, the NMC-OCW started execution of 24×7 Project. Pipelines were laid and connections were replaced. In 2015, the scenario started to change and people started receiving 24×7 water supply. In the past year and a half the lives of people there have been transformed. They are receiving 24×7 water supply and the contamination has gone long past. People are extremely happy with NMC-OCW for this. On Friday 14 April, Mr. Amitabh Kant visited Nagpur along with Hon’ble PM Shri Narendra Modi on the occasion of 126th Ambedkar Jayanti. He along with Hon’ble Municipal Commissioner Sharavan Hardikar and Alok Kumar, Advisor NITI Ayog interacted with a group of people benefitted by the 24×7 Project. The people enthusiastically shared their experience and how the new water supply scenario and NMC-OCW’s work has impacted their lives positively. “We are very happy now. Water was the biggest problem of our lives for years together. We had suffered a lot. Our lives were focused only on fetching water” Shared the people. NMC-OCW haven’t limited themselves to supplying water. But, they have gone beyond and have started an initiative of Model Slum Development. Under this initiative, the slums where water supply has improved and people have a lot of time saved because of assured water supply, NMC-OCW carry out various programs for health awareness, children’s education, women empowerment and livelihood. People shared their gratitude for all this and thanked the entire NMC-OCW team for the same. Hon’ble Municipal Commissioner also interacted with the beneficiaries. Mr. Amitabh Kant was highly impressed by the Project and appreciated Hon’ble Municipal Commissioner and team OCW. “It’s wonderful and admirable to see the sensitivity and inclusiveness of NITI Ayog top bosses coming out in slums of Nagpur in a scorching summer afternoon. We thank them for the same” expressed Mr. Arun Lakhani appreciating the keen interest of Mr. Amitabh Kant in this socio-technical project. They were also appraised about the Sewage Treatment and Reuse Project going on in Nagpur in which the treated sewage will be sold to Power Stations for Industrial Reuse. Both these unique projects caught the attention of Mr. Kant so much that he even appreciated them via 2 tweet on the micro-blogging site Twitter. Present at the occasion were Mr. Arun Lakhani, Chairman and Managing Director, Vishvaraj Infrastructure Ltd who is the brain behind the execution of the ambitious 24×7 Project, Hon’ble Municipal Commissioner, Advisor of NITI Ayog and Team OCW.